The experts weigh in on emerging risks. concerns, many would have answered Y2K. It turned out Y2K caused a lot of hysteria and a lot of computer consultants made a ton in the process. Then there are the risks that people don’t perceive but insurers do. Auto insurers know most accidents take place within a five-mile radius of the home. Drivers do not think about that when getting on the road. Insurers, actuaries, risk managers and world leaders see emerging risks from the broader perspective. Insurers have to think ahead to figure out which emerging risks they can cover and the cost. 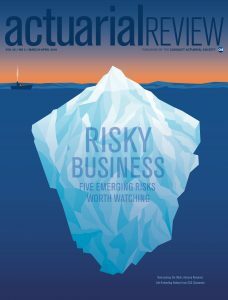 My most recent Actuarial Review article considers three recent surveys to break down five emerging risks from the insurance and business perspective. Consumers can benefit from the article as well. From a consumer standpoint, I see one big risk: data privacy. We unwittingly gave away a lot of personal information by participating in social media, “trusted” websites, DNA testing…the list goes on. Suppose personal data lands in the “wrong hands.” Just look back at history, assume it repeats itself, add in personal data and play it forward. I am hopeful about the California version of Europe’s General Data Protection Regulation, which is to go into effect next year. However, if the Silicon Valley companies (I won’t say who they are I will just point) can successfully lobby lawmakers, it might lose some teeth. Which emerging risks concern you and why?